Home / News / Capture the Moment! National Assisted Living Week is being observed this week, Sept. 9-15, 2018. “Capture the Moment” hopes to inspire residents to realize their dreams and seize the day. Simultaneously, the theme also supports reflection, as residents may look back on the pivotal moments in their lives. With the theme’s word play referencing photography, residents may refer to pictures or videos from their past. The theme aims to remind assisted living staff that often the little, everyday interactions with residents can deliver high quality, person-centered care. 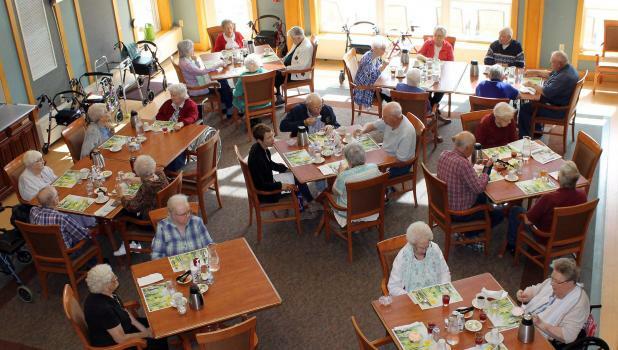 Assisted living communities across the country are encouraged to organize activities and events that help residents celebrate their past while also enjoying the present. The No.1 criteria for choosing assisted living is quality of life. Most seniors who have moved to assisted living or independent living communities report that they prefer life at their new home to living alone. For their families, its reassurance that their loved ones are being well taken care of. Knowing that staff is available 24/7 to care for their loved one, and that their family member is enjoying a strong quality of life, gives them peace of mind. The one item that each and every one of those interviewed for this article mentioned when asked about the “best of life” at The Maples was the food. There are many seniors who are used to living alone and may not currently be eating right. It seems that the trend is “fine” dining at The Maples, and appreciation for the staff that works hard to make dining a highlight of every day. At senior living communities, residents don’t have to worry about grocery shopping or meal preparation. Instead, they get to enjoy a fine dining experience every day of the week. See full story in this week's edition of the Springfield Advance-Press.